The Arkansas unemployment rate held steady in December at 3.6% after having registered a 0.1% uptick in November. The national unemployment rate rose from 3.7% to 3.9% in December. For the third consecutive month, the underlying components of the unemployment rate showed an increase in both the number of employed and the number of unemployed, implying an expanding labor force. For the period September through December, the household survey shows an employment increase of 2,843 and an unemployment increase of 1,881. Consequently, the labor force participation rate increased in December from 57.4% to 57.5%. As is often the case, this increase in labor force participation is mathematically associated with a higher unemployment rate (manifested in the November uptick), but is not an unambiguously negative development. Nonfarm payroll employment increased by 1,800 in December (seasonally adjusted), and the figure for November was also revised upward by 200 jobs compared to last month’s report. 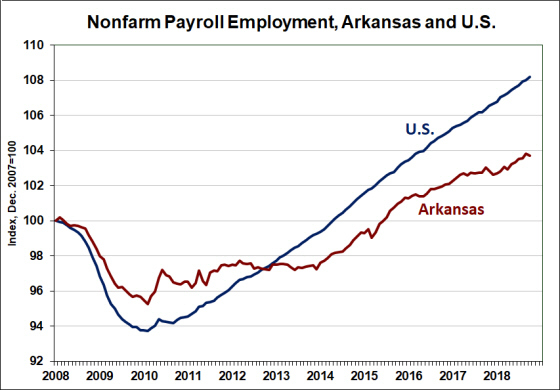 As a result, Arkansas payroll employment ended the year with 17,100 more jobs than at the end of 2017 — a growth rate of 1.4%. Over the same period, U.S. employment growth expanded by 1.8%. Throughout much of the current economic expansion, job growth has been almost entirely concentrated in service-providing sectors. In recent months, however, goods-producing sectors have been making a comeback. Manufacturing ended the year with an increase of 3,800 jobs (+2.4%), with gains in both durable and nondurable-goods manufacturing. With the construction sector also adding 1,900 jobs, good-producing sectors accounted for over 5% of the state’s job growth in 2018. In December alone, good producing sectors accounted for over 90% of total employment growth, with service-providing sectors adding only 100 net new jobs for the month. Job losses were reported for Transportation & Utilities, Financial Services, and Leisure & Hospitality Services. Professional & Business services continued to expand, with employment up 500 for the month and up 4,800 since December 2007. Today’s report is the last monthly update before the annual revisions to the data are announced. Updated estimates of household employment and the unemployment rate will be released on February 28, and the “benchmark revision” to payroll employment will be unveiled on March 11. Indications of a slightly weaker labor market statewide were also reflected in metro area employment statistics for October. According to this morning’s report from the Bureau of Labor Statistics, only 95 of 388 metro areas registered unemployment rates higher than a year ago. In Arkansas, six of eight metro areas were in that group. 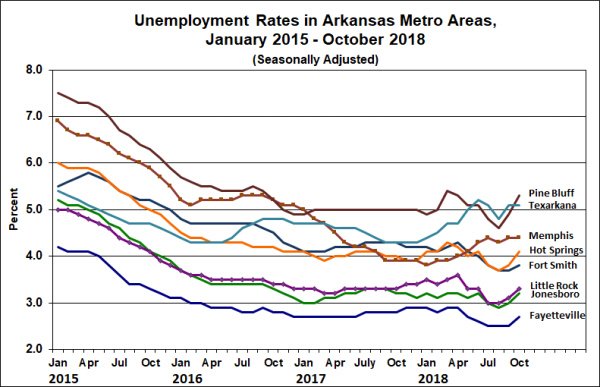 Seasonally adjusted data showed monthly increases in unemployment rates for six Arkansas metros as well. 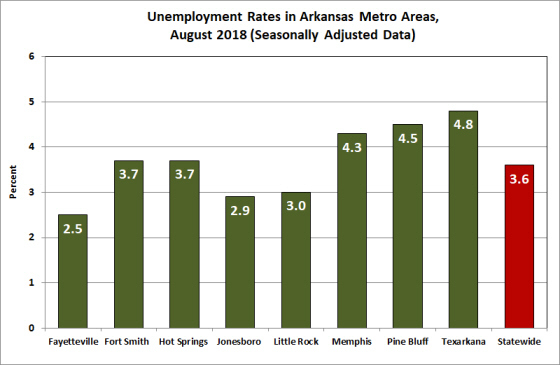 Underlying the changes in unemployment rates, the number of unemployed individuals increased in all eight Arkansas metro areas. Unemployment rates remain at historic low levels, particularly in the Fayetteville, Jonesboro, and Little Rock. In other areas of the state, unemployment remains elevated. In both Pine Bluff and Texarkana, rates have crept back above 5%. As shown in the figure below, however, recent increases in unemployment rates generally reflect reversals of the declines we saw earlier in the year. These types of transitory fluctuation are often smoothed away when the data are revised, so we might expect to see metro unemployment rates appear more stable after the January 2019 revisions are completed. 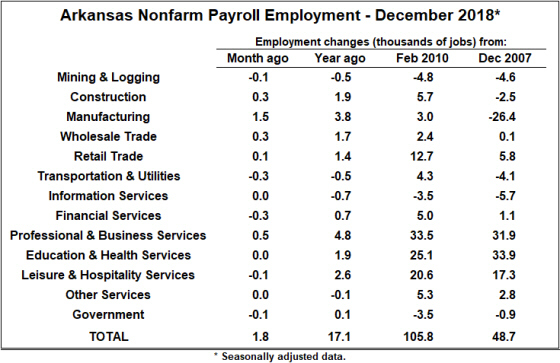 Changes in nonfarm payroll employment were mixed across Arkansas metro areas. Statewide employment declined slightly in October, but the job losses appeared to be concentrated in three metro areas: Little Rock, Pine Bluff, and Texarkana. Payrolls continued to grow in both the Northeast and Northwest regions of the state. 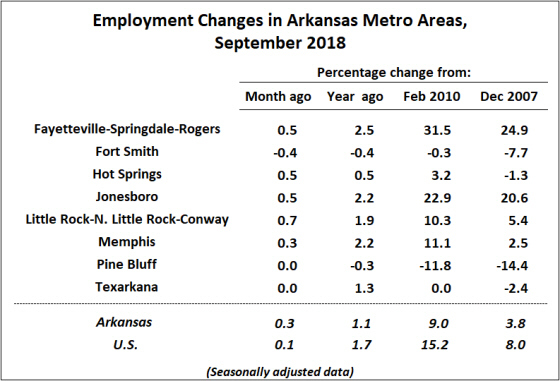 Over the past 12 months, employment has increased in all of Arkansas’ metro areas except Pine Bluff, where employment declines continue to accumulate. Growth in Northwest Arkansas appears to have slowed somewhat, with percentage increases in Jonesboro, Memphis and Little Rock exceeding the growth rate in the Fayetteville-Springdale-Rogers metro area. There is little to cheer about in the latest report on Arkansas employment and unemployment. The headline sounds fine: the state’s unemployment rate remained at the low level of 3.5% — slightly lower than the national unemployment rate of 3.7% (though the difference is not statistically significant). However, changes in the statistics underlying the latest reading on the unemployment rate were not unambiguously positive. Household employment ticked up a bit (+670) but is still down more than 8,000 from a year ago. The number of unemployed had been declining for five consecutive months but increased slightly in October (+211). As a result of these increases, the labor force expanded by 881, but is down 11,000 from a year ago. The state’s labor force participation rate was unchanged at 55.4%, down 0.9% from October 2017. 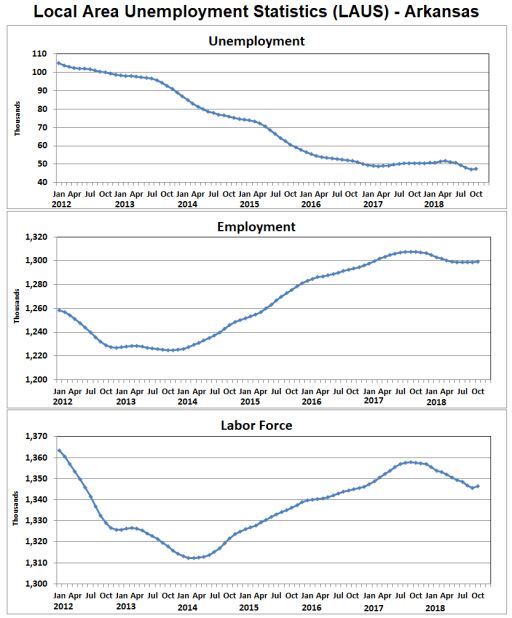 Nonfarm payroll employment declined by 1,200 in October, and the September employment figure was revised down by 200. Compared to October 2017, Arkansas employment up 8,400, about 0.7%. Over the same 12 months, U.S. employment has increased 1.7%. The October decline in payrolls corresponded to job-losses in Retail Trade, Financial Services, Other Services, Mining & Logging, and Manufacturing. Gains in other sectors were generally small, and the high-growth sector of Professional & Business Services stalled in October. Although total job growth over the past 12 months has slowed, year-over-year gains in goods-producing sectors remain encouraging and growth in Professional & Business Services and Education & Health services continue to drive overall employment higher. Although the granules of good news in the October employment report are rare, we always caution that a single month of data should not be overemphasized. Unemployment remains low and payroll employment continues to rise (albeit at a slowing pace). There’s no reason to expect those fundamentals to change. 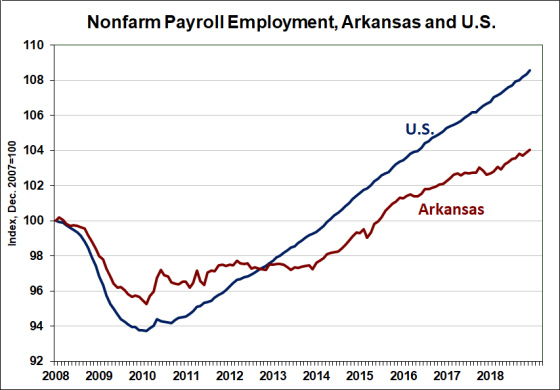 We will continue to monitor monthly changes, with particular interest on how the annual data revisions due in early 2019 will affect our view of recent labor market developments in Arkansas. The Bureau of Economic Analysis announced this morning that the recent acceleration in national GDP growth was reflected second quarter statistics for the 50 states: Growth rates ranged from 2.5% in Delaware to 6.0% in Texas. Arkansas’ growth rate was 4.4% — the tenth-highest growth rate in the nation. 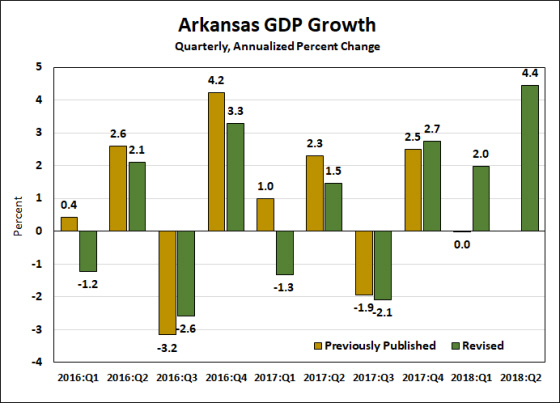 As part of a comprehensive revision of the state GDP data (more below), Arkansas first quarter growth rate was also revised up from 0.0% to 2.0%. From 2017:Q2 to 2018:Q2, Arkansas GDP growth has been 1.7%, compared to 2.9% for the U.S.
Agriculture was by far the largest contributor to Arkansas’ GDP growth, accounting for 1.27 percentage points of the state’s 4.4% growth rate. Other sectors adding significantly to growth included Real estate, Information and Utilities. Durable goods manufacturing was also a notable area of strength for both Arkansas and the U.S. 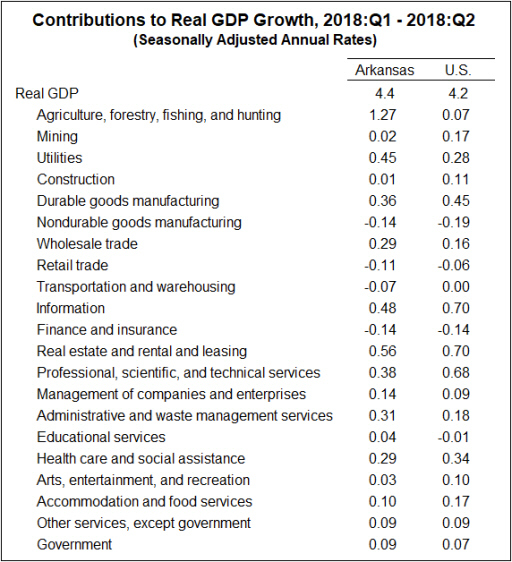 The only negative contributors to Arkansas growth were Finance and insurance, Retail trade and Nondurable goods manufacturing. This morning’s data release incorporated the results of the BEA’s comprehensive update of GDP by state, incorporation more complete and detailed source data than was previously available. The base year for price adjustment was also changed from 2009 to 2012. 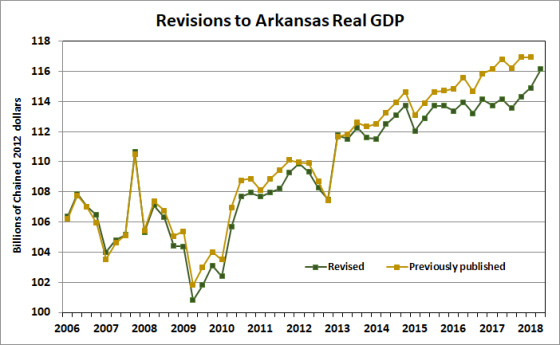 For Arkansas, the revisions had the effect of lowering the level of GDP estimates for much of the past decade. The revised data show a somewhat sharper downturn during the “Great Recession” of 2008-09, and also show sharply slower growth over the period 2013 through 2017. From 2013:Q1 through 2017:Q4 the revised data show a growth rate of 0.5% compared to 1.0% in the previously published data (annual rates). Source: Bureau of Economic Analysis. Note – Previously published data have been converted from the 2009 base year to the new benchmark of 2012. For more recent periods, the data revisions mark something of an improvement. Quarterly growth rates for Arkansas were revised up from 0.0% to 2.0% for the first quarter of 2018, and up from 2.5% to 2.7% for the fourth quarter of 2017. 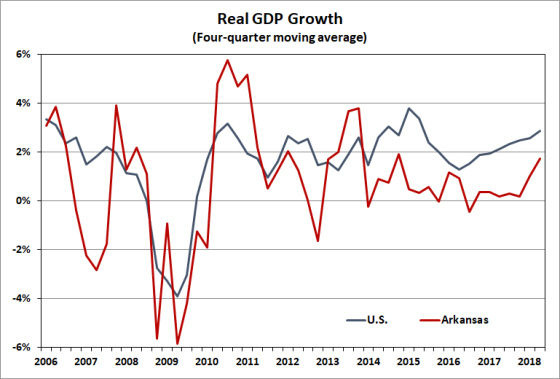 Although the newly-revised data give cause for reassessing the strength of Arkansas’ economic expansion over the past several years, the latest readings provide reason to be optimistic that the recent pick-up in GDP growth nationwide is also being enjoyed here in Arkansas. September data from the Bureau of Labor Statistics reveals an unusual pattern of unemployment rate changes: While the statewide average declined 0.1 percentage points from August to September, metro area unemployment rates rose slightly (with the exception of Fort Smith, unchanged). This might indicate an improvement in the non-metropolitan regions of the state, but is more likely an artifact of monthly “noise” in the data and/or differences in the state and metro seasonal adjustment methodologies. Changes over the previous twelve months (not-seasonally adjusted data) are more consistent, with five metro areas matching or exceeding the 0.2 percentage point decline statewide. Rates in Memphis and Texarkana were higher compared to a year ago. In fact, Texarkana earned the dubious distinction of experiencing the largest year-over-year increase in the nation. The figure below compares the seasonally adjusted metro area unemployment rates with the statewide average. The eight areas have sorted into three broad categories: The relatively rapid-growing metros of Fayetteville, Jonesboro and Little Rock have unemployment rates lower than the statewide average; Fort Smith and Hot Springs are slightly higher than the statewide average (though not significantly so) while Memphis, Pine Bluff and Texarkana have the highest unemployment rates in the state — well above the statewide average. 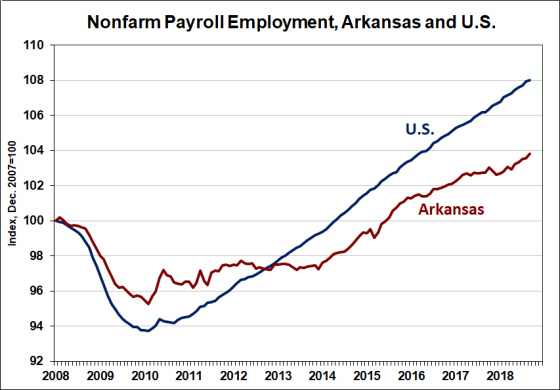 From August to September, nonfarm payroll employment rose sharply in Fayetteville, Hot Springs, Jonesboro, Little Rock, and Memphis. Pine Bluff and Texarkana were unchanged, while Fort Smith suffered a 0.4% contraction. 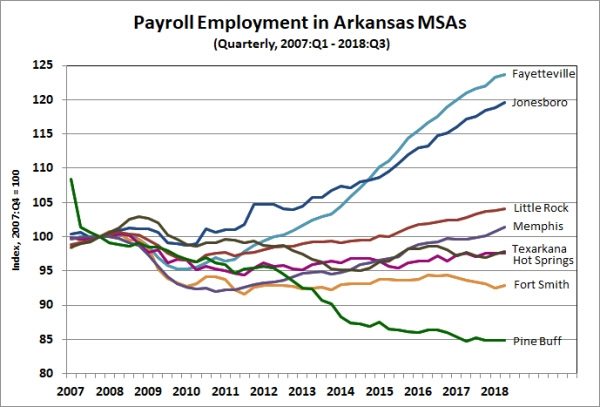 Over the past twelve months, both Fort Smith and Pine Bluff have declined, and indeed, employment in both metros remain lower than the cyclical trough of February 2010. 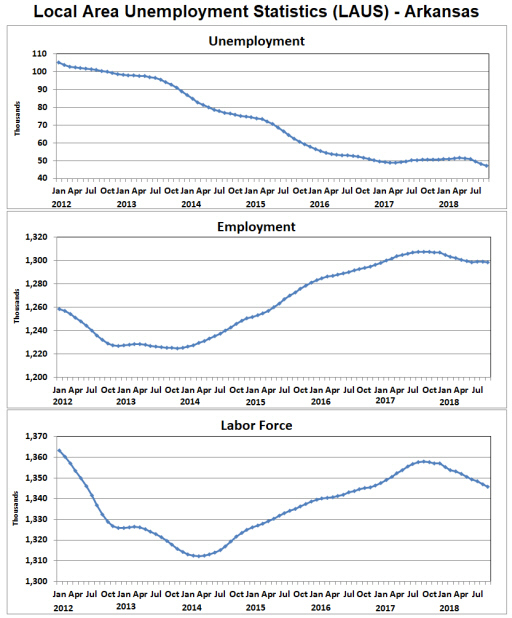 As shown in the final column of the table above and illustrated using quarterly averages in the chart below, only two metro areas have experienced robust employment growth over the past decade (Fayetteville and Jonesboro), while employment in Little Rock and Memphis is only slightly higher than at the previous cyclical peak. Employment levels in Texarkana, Hot Springs and Fort Smith remain below pre-recession levels, as does Pine Bluff, which is down 15% from a decade ago. The latest report on employment and unemployment in Arkansas included several positive indicators. First, the unemployment rate declined once again, dropping to 3.5%. 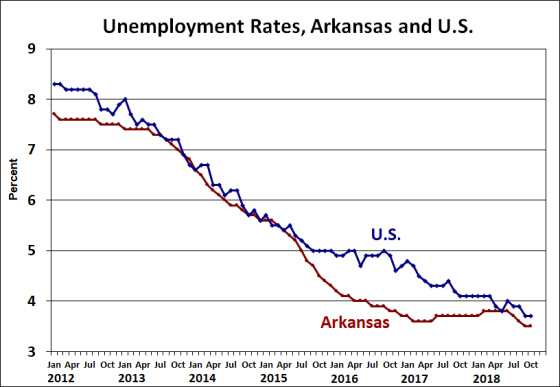 The national unemployment rate also declined in September, so Arkansas’ rate remains only slightly lower than the U.S. average of 3.7% (and the difference is not statistically significant). The driving force behind recent declines in Arkansas’ unemployment rate is a rather sharp decline in the number of unemployed, which declined by 891 in September and has fallen by 4,400 since April. Meanwhile, the household survey is also showing a decline in the number of employed Arkansans, down by 329 in September and down by over 9,000 over the past 12 months. Accordingly, the labor force is contracting as well. 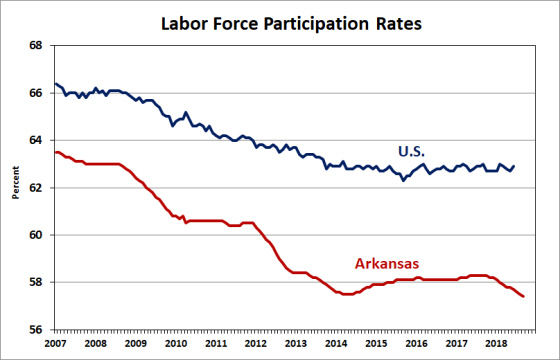 At 3.5%, the Arkansas unemployment rate is at an all-time low. While the low number of workers seeking a job is certainly a positive indicator for the strength of the labor market, recent declines in the labor force participation rate complicate the interpretation of the unemployment rate. With the labor force declining, the labor force participation rate is significantly lower than it was during the previous economic expansion, declining in September by another 0.1 percentage point to 57.4%. That’s down almost a full percentage point from a year ago and down nearly 6% from a decade ago. So while a smaller fraction of the labor force is actively seeking employment, the labor force itself comprises a much smaller share of the state’s population than it was the last time we experienced low unemployment. While the employment figures from the household survey continue to decline, the news from the payroll survey – which is generally considered a more accurate measure of job growth – is much more upbeat. Nonfarm payroll employment expanded by 3,200 in September (seasonally adjusted). The employment figure for August was revised upward by 1,600 as well, turning that month’s employment change from a preliminary decline of 900 jobs to a revised increase of 700 jobs. Over the past 12 months, payroll employment is up by 13,200 jobs – approximately 1.1%. Over the same period, nationwide employment growth was 1.7%. A breakdown by major sectors shows that the September increase was reflected both the goods-producing and service-providing sides of the economy: Strong gains were registered in Education & Health Services, Professional & Business Services, Transportation & Utilities, and Wholesale Trade. Construction and Manufacturing were both up for the month, adding to increases from earlier in the year. The only sectors to show notable declines were Retail Trade and Other Services. Over the past 12 months, Professional and Business Services is by far the largest contributor to job growth (+6,600 jobs), but a healthy gain of 2,800 jobs in Manufacturing also contributed to the overall increase, as did a 2,000-job increase in Transportation & Utilities. NOVEMBER 9, 2018 | 7:30 a.m. – 10:30 a.m.
Join us as Chris Varvares of IHS Markit and Dr. Michael Pakko of the Arkansas Economic Development Institute (AEDI) provide updates on economic conditions and the outlook for the nation and the state. Hosts for the event are the Little Rock Branch of the Federal Reserve Bank of St. Louis and the Arkansas Economic Development Institute. Varvares, co-head of U.S. economics at IHS Markit, an information and analytics firm, will present the national outlook. Pakko, chief economist and state economic forecaster with AEDI will present his annual forecast for the Arkansas economy. A hot buffet breakfast will be served. The event is free, but register soon, because space is limited. THE DEADLINE TO REGISTER IS NOVEMBER 5! The Bureau of Economic Analysis reported today that Personal Consumption Expenditures (PCE) rose by 4.3% in 2017, matching the nationwide growth rate. PCE is not adjusted for inflation, so after accounting for a 1.8% increase in prices from 2016 to 2017, real PCE increased by about 2.5%. From 2011 through 2015, Arkansas PCE growth ran slightly slower than the national average. In 2016 and 2017, Arkansas growth rate has kept pace with the rest of the nation. 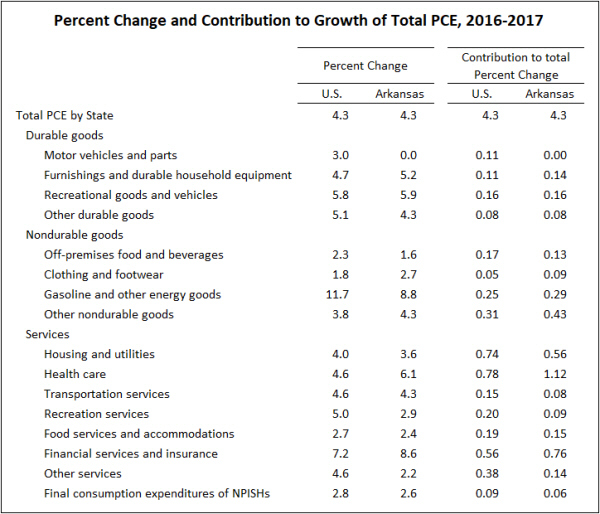 The fastest-growing components of PCE in 2017 were Gasoline and other energy goods; Financial services and insurance; and Health care. The gasoline and health care components were cited in the BEA report as being leading factors for growth in most states. Notably, there were no components of spending that declined in 2017. 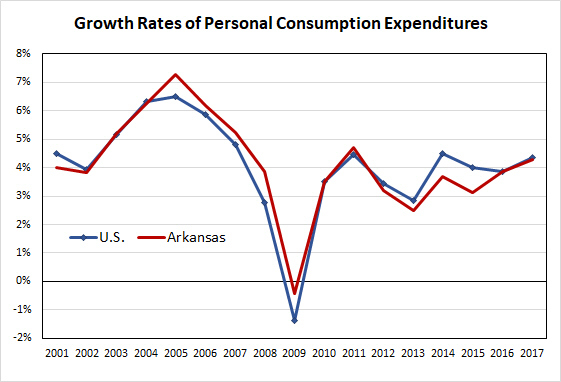 On a per capita basis, PCE growth in Arkansas was 3.7%, slightly higher than the 3.6% national growth rate. At $32,875, per capita spending in Arkansas amounted to approximately 80% of the national average. Among the 50 states plus the District of Columbia, Arkansas ranked #49 in terms of the level of PCE per capita. 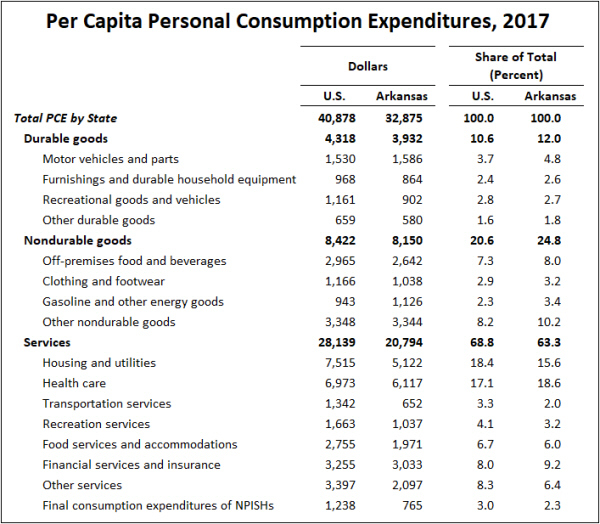 The only major component for which Arkansans spend more per person than the nationwide average is on Motor vehicles and parts. At the other extreme, spending on Transportation services amounts to less than one-half of the per capita level nationwide. Spending shares by component follow a familiar pattern: Arkansans devote a larger share of their budgets to purchases of goods (which tend to display small inter-regional differences in price) and a relatively smaller share on services (for which prices are more closely related to Arkansas’ status as a low cost-of-living state). Unemployment rates were unchanged or down slightly in Arkansas’ metro areas in August. It had been previously reported that the statewide unemployment rate ticked down 0.1 percentage points for the month. Today’s data release shows that the change was reflected in similar declines for Fort Smith, Hot Springs, Jonesboro and Memphis. Pine Bluff and Texarkana saw even large declines, while unemployment rates in the Fayetteville and Little Rock metro areas were unchanged. Compared to a year ago, unemployment rates are down 0.4 to 0.7 percentage points in six of the eight metro areas. In Memphis and Texarkana, however, rates are slightly higher than a year ago. 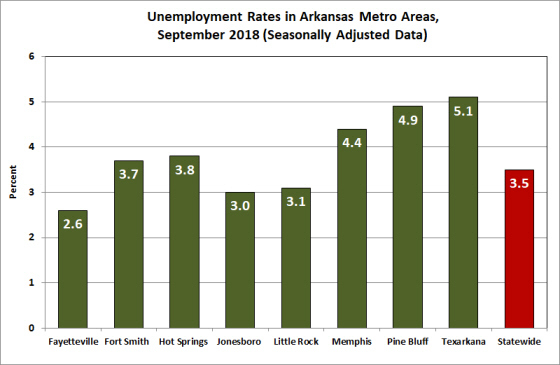 On a seasonally adjusted basis, the level of unemployment rates in Arkansas varied from a low of 2.5% in Northwest Arkansas to a high of 4.8% in Texarkana. 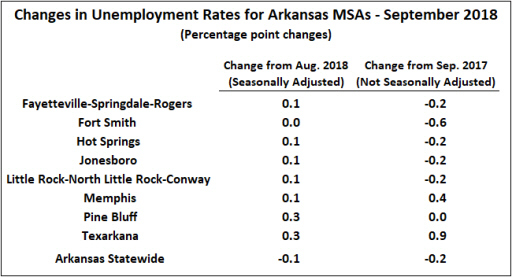 Unemployment rates were below the statewide average in Fayetteville, Jonesboro, and Little Rock; and were higher than the statewide average in Memphis, Pine Bluff and Texarkana. Unemployment rates in Hot Springs and Fort Smith are essentially the same as the statewide figure. Nonfarm payroll employment was down slightly on a statewide basis in August, but changes among metro areas were mixed. 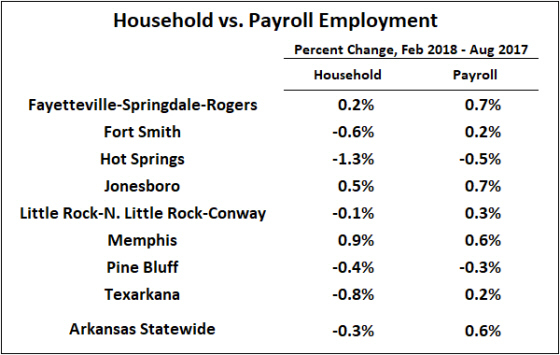 Fayetteville, Fort Smith, Jonesboro and Memphis registered slight gains, while Hot Springs and Little Rock saw employment declines. Pine Bluff and Texarkana were unchanged. Over the past year, employment has been unchanged or down slightly in Fort Smith, Hot Springs and Pine Bluff. All other metro areas have seen net increases, with the magnitude of gains particularly notable in Fayetteville, Jonesboro, and Memphis. In the context of the statewide numbers, we have noted that the measures of employment estimated from the household survey have been growing at a significantly slower pace than the payroll employment figures. Over the most recent six months, the household survey (used to calculate the unemployment rate) has declined by 0.3% statewide, while the payroll survey is showing an employment increase of 0.6%. As shown in the table below, this discrepancy carries over to several of the state’s metro areas. The differences are largest in Fort Smith, Hot Springs and Texarkana. Although both sets of employment estimates will be revised early next year, the payroll survey is generally considered to be the more accurate of the two. Consequently, employment conditions in the state’s metro areas are better expressed in the recent statistics on payroll employment, and the household data (including unemployment rates) are more likely to be revised in those metro areas where the discrepancies are the largest. Total personal income increased at an annualized rate of 5.1% in the second quarter of 2018, recording the 7th highest growth rate among the 50 states. Nationwide, personal income rose at a rate of 4.2% for the quarter. 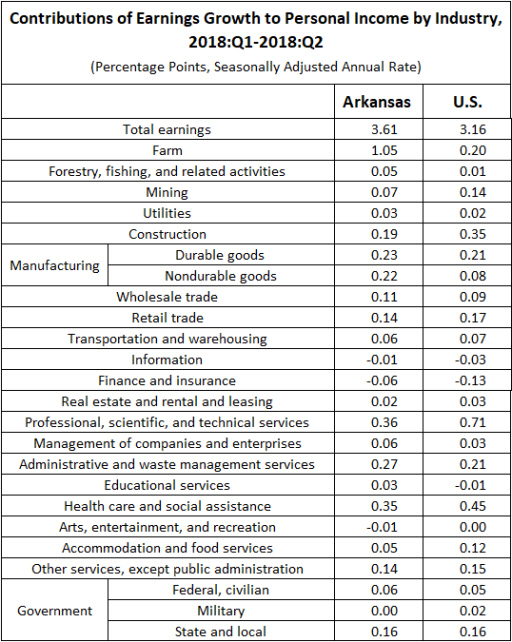 The news release from the Bureau of Economic Analysis noted that Arkansas was one of nine states where the volatile farm earnings component contributed one-half a percentage point or more to increases in personal income. 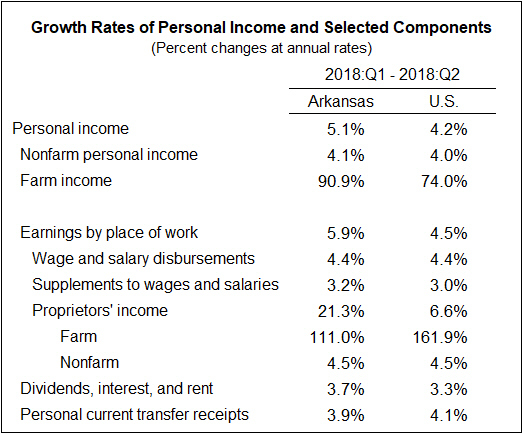 At a 91% annualized growth rate, farm income actually contributed over a full percentage point to Arkansas personal income growth. Excluding farm income, Arkansas incomes expanded at a 4.1% rate, slightly higher than the 4.0% national average. Among other major components, wage and salary growth, plus supplements, grew slightly faster in Arkansas than the U.S. average. Proprietors’ income in Arkansas was boosted by a 111% increase in Farm proprietors’ income, but nonfarm proprietors’ income rose at a rate of only 4.5% — matching the nationwide average. Growth in Dividends, interest, and rent (3.7%) exceeded the U.S. growth rate (3.3%) while Personal current transfer receipts grew at a slightly slower rate (3.9% for Arkansas compared to 4.1% for the U.S.). Percent changes from quarter to quarter can be quite volatile, so a better measure of longer term growth trends is the percentage change from a year earlier. 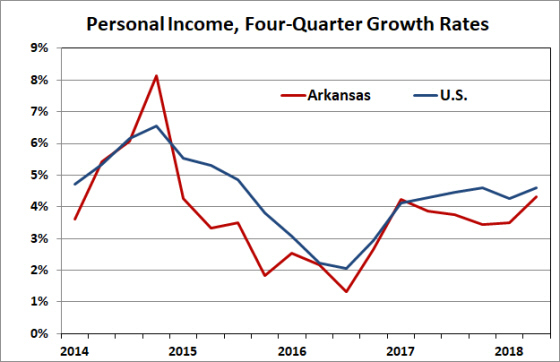 By this measure, From 2017:Q2, Arkansas personal income increased 4.3%, compared to an gain of 4.6% nationwide. As illustrated in the chart below, Arkansas income growth has generally been slower than the U.S. average in recent years. From 2015:Q1, year-over-year growth has averaged 3.2% in Arkansas, 0.8% below the nationwide average of 4.0%. Total earnings (which include wages and salaries, supplements and proprietors’ income) also grew faster than the U.S. average, 3.6% compared to 3.2%. The table breaks down the contribution of earnings by industry to total personal income. Once again, the role of farm earnings in boosting total personal income is apparent. Among other sectors, Arkansas personal income was boosted by growth in Manufacturing; Professional, scientific, and technical services; and Health care and social assistance. Nondurable goods manufacturing, in particular, contributed more to Arkansas income growth it did to U.S. growth. Today’s data release included a comprehensive update of state personal income, incorporating more detailed and complete source data, updated seasonal factors, and the results of the July 2018 comprehensive update of the National Income and Product Accounts. 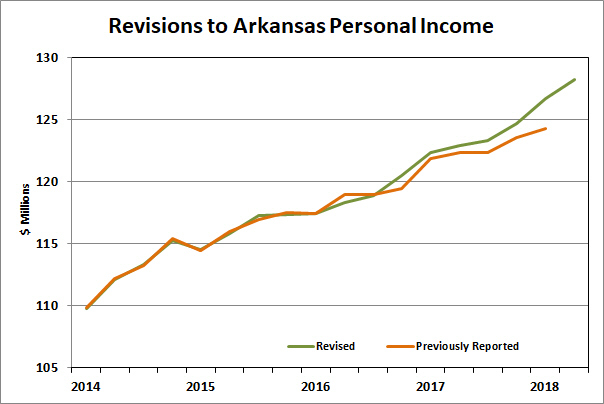 The figures below illustrate the nature of the revisions for Arkansas total personal income. In terms of levels, the revised data show slightly lower incomes in early 2016, but the revisions are cumulatively all positive since then. 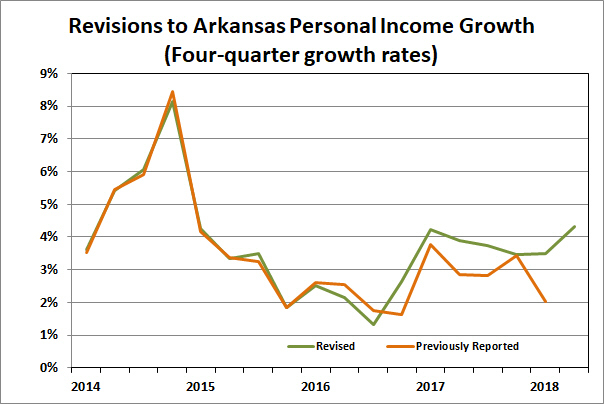 The revisions result in higher growth estimates for Arkansas: Over the four quarters ended 2018:Q1, previously published data had reported a growth rate of 2.0%, and the data revisions increased that estimate to 3.5%.